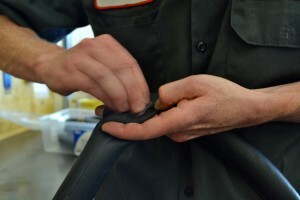 Last month we covered how to replace a flat tube with a new one. This month we’ll show you how to patch the tube. 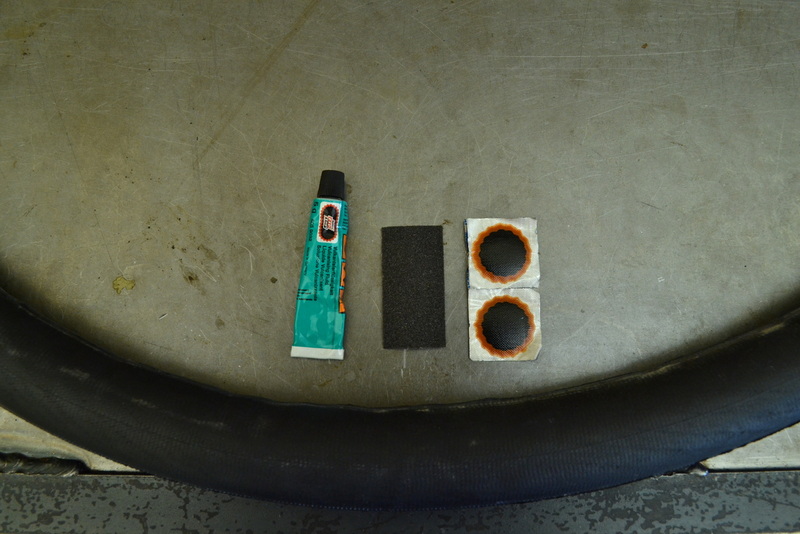 To patch a punctured tube, you will need a patch kit containing patches, glue, and emery cloth or sandpaper. Traditional patches tend to give a more permanent fix than “glueless patches,” but those will still get you home. The best tip for patching success is to sand bigger than you glue, and glue bigger than you patch. 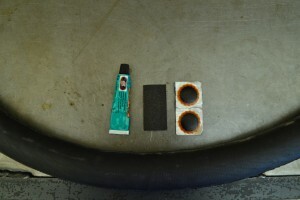 Start by removing the wheel from the bike and the tire from the wheel (see last month’s tip for a step by step guide). Put a little air in the tube to find the puncture. 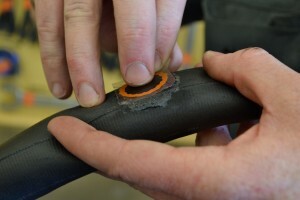 If the puncture is a tear at the valve or a star shaped blow out, you won’t be able to patch it. When you find the hole draw a box or circle around it with chalk or a marker. This will help you sand in the correct spot. Sand an area around the puncture that is bigger than the patch, with the puncture in the middle of the sanded area. 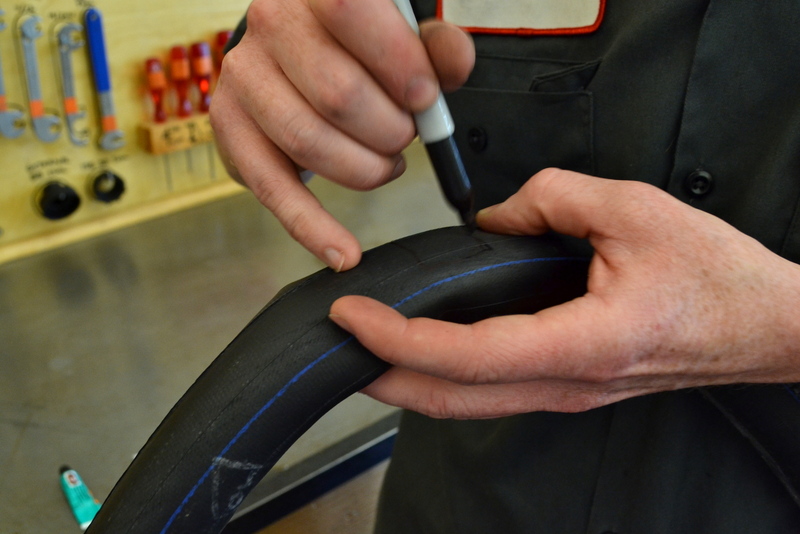 Be sure to sand any seams near the puncture completely flat. Apply the glue evenly to the sanded area. Cover an area that is bigger than the patch and let it dry for 2-7 minutes. You’ll know it’s ready when it turns from really glossy to matte in appearance. Carefully pull the foil off the back of the patch, but don’t touch the patch. Place it on the semi dried glue, centered over the puncture, and press firmly for 30-60 seconds. Peel the clear plastic film off the back of the patch. If you see the edges of the patch peel up, stop and leave the film in place. 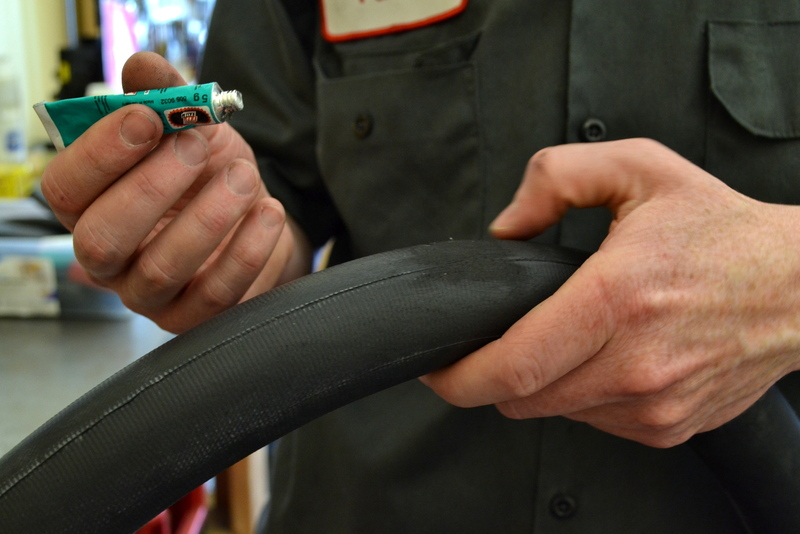 Put the tube back in the tire, the tire on the rim, and inflate to the tire’s recommended psi. You’re done! A properly patched tube is just as good as a new one. It might take a few tries to get one that really holds in the long run, so be patient. Remember to sand bigger than you glue, and glue bigger than you patch. We don’t patch as a service in our bike shop, but if you want a more hands on lesson, come in and talk to one of our friendly mechanics.